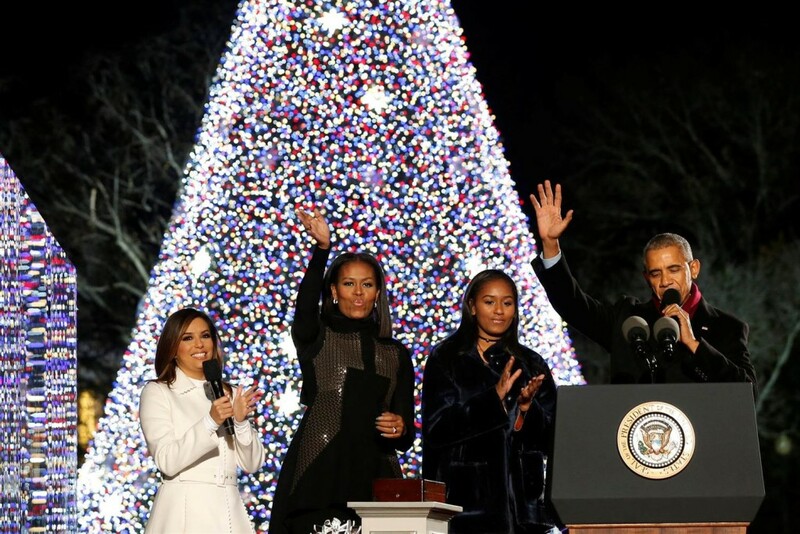 If only to hear President Obama join Chance the Rapper on “Jingle Bells,” it may be worth tuning into the “National Christmas Tree Lighting” (Hallmark, 7 p.m.). The annual event is rarely also on TV but last week’s ceremony, hosted by Eva Longoria also featured James Taylor, the Lumineers, Yolanda Adams. Plus there might be a bit of nostalgia in sharing one of Obama’s last public events. It’s the year’s biggest night in network lasciviousness, “The Victoria’s Secret Fashion Show” (CBS, 10 p.m.), this year outsourced to Paris, where models stomp around in skimpy, impractical designs, editors work overtime to make it look flashy and not trashy, and Lady Gaga, Bruno Mars and the Weeknd perform. But all the feathers and wings seem pretty impractical as undergarments. Harlem’s famed theater gets network time as well in the special “Showtime at the Apollo” (Fox, 8 p.m.) in which Steve Harvey hosts a show that includes performances from En Vogue, Doug E. Fresh, Mike Epps, Tracy Morgan, Rakim and Bell Biv Devoe. Plus they get the hook out for the usual amateur tryouts. From the people who brought you “The Black List,” “The Latino List” and “The Out List” comes “The Trans List” (HBO, 8 p.m.), with portraits of people that include Caitlyn Jenner, Laverne Cox and Caroline Cossey. Electricity bills are sure to escalate once more as “The Great Christmas Light Fight” (ABC, 8 p.m.) begins its fourth season of families trying to outdo one another in going overboard with decorations. In the tradition of “Below Deck,” about luxury cruise ships accommodating new riders, here is the new “Timber Creek Lodge” (Bravo, 10 p.m.), which welcomes new groups of visitors each week as the staff encounters its own romantic entanglements. First to call, military dudes with a bachelor party. Not to be confused with “Hotel Impossible” (Travel, 10 p.m.). A storm bears down on “Mars” (National Geographic, 9 p.m.), which is not to be confused with “Mars: The Secret Science” (Science, 9 p.m.). Gerry says goodbye to StarCrossed on “People of Earth” (TBS, 9 p.m.). A mass murder in a Missouri farm town is recalled on “The 1980s: The Deadliest Decade” (Investigation Discovery, 9 p.m.). Bonnie and Clyde won’t know what to make of the crew from “Timeless” (NBC, 10 p.m.) when they come to visit. The Top 8 perform on the semifinals of “The Voice” (NBC, 8 p.m.). Kids damage a wall on “Man With a Plan” (CBS, 8:30 p.m.). You would too. The crossover episodes over, “Supergirl” (The CW, 8 and 9 p.m.) is back with a couple of reruns. Kevin scores tickets to a Billy Joel concert on “Kevin Can Wait” (CBS, 8 p.m.) and the singer makes a cameo. A death row case is reopened on “Conviction” (ABC, 10 p.m.). Jason Derulo and Jamie Chung sip eggnog at “Martha & Snoop’s Dinner Party” (VH1, 10 p.m.). Holiday movies include the standby “National Lamppon’s Christmas Vacation” (Freeform, 7 p.m.), “Merry Matrimony” (Hallmark, 8 p.m.), “All I Want for Christmas” (Lifetime, 8 p.m.), Bill Murray in “Scrooged” (Freeform, 9 p.m.), “The Christmas Gift” (Lifetime, 10 p.m.), “Christmas Incorporated” (Hallmark, 10 p.m.) and “Tyler Perry’s A Madea Christmas” (USA, 11:05 p.m.). Turner Classic Movies celebrates the 90th anniversary of Vitaphone Pictures with 24 hours of programming, including the one film that put them in on the map, “The Jazz Singer” (TCM, 6 p.m.) as well as 63 shorts and five features. Among them, “The Better ‘Ole” (8:15 a.m.), the comedy “Why Be Good?” (11 p.m.), and the musical “Show Girl in Hollywood” (1:45 a.m.). Monday Night Football has Indianapolis at Jets (ESPN, 8:15 p.m.). Men’s college basketball includes Cal State-Northridge at St. John’s (Fox Sports 1, 6:30 p.m.), Stetson at Iowa (ESPNU, 7 p.m.) and Syracuse at Connecticut (ESPN2, 7 p.m.). Pro games include Boston at Houston (NBA, 8 p.m.). Kelly Ripa: Jason Bateman, Jeffrey Donovan, Corbin Bleu. The View: Steve Harvey, Helen Mirren. The Talk: Steve Harvey, Helen Mirren. The Talk: Chrissy Metz, Natalie Morales, Kacey Musgraves, Shear Moore. Harry Connick: Patricia Heaton, Miss Piggy, Meathead Goldwyn, Meredith Hagner. Ellen DeGeneres: Justin Bieber, Felicity Jones, “Fuller House” cast. Wendy Williams: Adriana Lima, Nicole Lapin. The Real: Cynthia Addai-Robinson, Evelyn Lozada. Stephen Colbert: Jason Bateman, Padma Lakshmi, Michael Lewis. Jimmy Kimmel: Will Smith, Adam Perry Lang. Jimmy Fallon: Annette Bening, Steve Harvey, the Hamilton Mixtape. Seth Meyers: Kate McKinnon, Benjamin Bratt, the Hold Steady, Abe Cunningham. James Corden: Gael Garcia Benal, Lauren Cohan, John Legend. Carson Daly: Emmanuelle Chriqui, Wolf Parade, Tony Cox. Trevor Noah: Van Jones. Conan O”Brien: Luke Wilson, Robert Kirkman, Sam Morrill.